Persistence Market Research showcases a comprehensive and detailed review of the global men’s grooming products market. The report titled Global Market Study on Men's Grooming Products: Shave Care Product Type Segment Estimated to Account for Significant Market Share Through 2024. The report revolves around different geographies and regions and tries to fish out some crucial and relevant data from the core of the global men’s grooming products market. The report is a transparent analysis of the global and local markets and it also delves out important information about the future and present of the market. 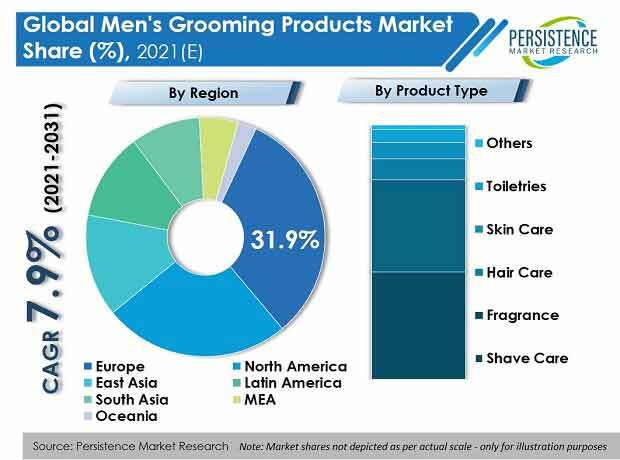 The report was curated by considering all the key data and by correctly understanding market psyche which is likely to impact the evolution of the global men's grooming products market. The report registers all the major market shifts and also notes down the key trends, drivers, and restraints that are expected to play an important role in building an ecosystem of development in the global men’s grooming products market. Our skilled team of analysts has adopted some innovative ways and collated and calculated numbers fetched from the market to reach a suitable conclusion. The report cuts through the profiles of the key players present in the global men’s grooming products market and analyses their business strategies meticulously to get hold of their upcoming market movements. The report on the global men’s grooming products market starts with market definition followed by market taxonomy and parent/associated market overview. The next section of the report talks vividly about the pricing analysis and dissects the price projections per region. Market size, market overview, market dynamics, restraints and extended segmentation is also a part of this illustrated report. The pricing section is a very new portion of this report as it predicts market appreciation and depreciation of products on the basis of their pricing. Apart from this the pricing section of the report also describes how several factors in a particular region will impact the pricing of a particular product in that regional market. The other segments of the report talk about the trends and drivers and restraints that are expected to redefine the market size and market worth. The last segment of the market describes the individual contribution of key market players in the growth of the global men’s grooming products market. The last section is meant to table crucial data and presents a dashboard view of the competitive landscape of the global men’s grooming products market. The research team reached the final conclusion of the report through a tedious process. During the secondary research, the team scrutinized the personal care industry scene, extensively studied different white papers and collected an overview of the market and understood the growth projections of the market, analyzed the market share by region and also inspected different press releases and company news to get a better understanding of the market. Primary research helped the team understand the drivers and restraints likely to impact the growth of the global men’s grooming products market. Through primary research, our analyst team identified the present and future market value potential, market concentration, major suppliers and major trends by region. Metrics curate the base of a report. The report on the global men’s grooming products market talks about all the major metrics to provide an extended picture of the market. The report uses accumulated data to compare and contrast the performance of the market across geographies. As a research firm, we know that every market is volatile and the overall performance of any market is completely dependent on the unpredictable, evolving nature of economy and region and a slew of other factors. The report estimates the compound annual growth result (CAGR) of the regional and global markets and also notes down the Y-O-Y spike of the global men’s grooming products market to understand the right opportunities and the market climate. The research adopts a multi-dimensional approach to measuring the embryonic growth of the regional markets. A detailed approach towards the market helps understand the significant trends that are predicted to dominate the market in the coming years. Another notable feature of this report is an analysis of the revenue forecast of the global men’s grooming products market in terms of absolute dollar opportunity. While this is usually overlooked when forecasting the market, we believe absolute dollar opportunity analysis is critical in assessing the level of opportunity that market providers can look to achieve and also to identify potential resources in the global men’s grooming products market. The global men’s grooming products market report dissects the market segments on the basis of their individual performance and growth graph. The market attractiveness index at the end helps key stakeholders identify the future and present market scope of the global men’s grooming products market. Our report on the global men’s grooming products market provides a market outlook for the period 2015 – 2024. The annual change in inflation rate has not been considered while doing the research. All values for 2015 have been registered to provide a transparent view of the global men’s grooming products market. Though beard is the new style statement of urban men and signature of their “machismo”, clean shaven men look more hygienic and well groomed. Market trends also back this bent. The global men’s grooming products market is predicted to bloom in the forthcoming years. The global men’s grooming products market is expected to expand within the prediction period at a CAGR of 8.4%. The market will showcase a razor sharp growth in the APAC region. The North America and Europe markets will play a crucial role in this period of transition. The shave care segment of the global men’s grooming products market dominated men’s grooming kits till the end of 2015 and it will continue to rule the markets of developed regions in the years to come. In the North America market, the shave care segment is predicted to record a CAGR of 6.0%. Hygiene has been a pertinent issue for men living in this region of the globe. The market will be largely affected by this changing nature of men of this region and will complement the natural growth of the shave care segment in North America. The shave care segment is likely to register a shining CAGR within the period of assessment. This segment is expected to hold more than 38% value share of the global mens grooming products market. The shave care segment will be worth around US$ 22 Mn in 2016 and the market value will climb up to US$ 40 Mn by the end of 2024. The market will curate a dollar opportunity of more than US$ 18 Mn between the period of forecast. The global men’s grooming products market is populated with a gamut of products and multiple selling channels to cater to the rising demand of consumers. Customers are knowledgeable and several e-commerce platforms have given them access to a larger global market. This is a major factor that is expected to change the face of the global men’s grooming products market. The men’s grooming products market is spread across Europe and North America but the resurgence of the new crop of economically empowered customers in the APAC region will set the tune for the development of the men’s grooming products market in this region. The shave care segment will also reap the benefits of this changing climate of the market in the APAC region. As per value, the shave care segment in this region will witness a CAGR of 7.5%. The expansion of consumerism and boom in e-commerce is likely to impact the growth of the shave care segment in the APAC region. Procter & Gamble was a leader in shave care and reigned the shave care segment in 2015 with quality products. The Edgewell Personal Care Co. is another key player in the shave care segment and occupied more than 6% of the market share in 2015. Koninklijke Philips N.V. accounted for 6.8% share of the shave care segment in 2015. Royal Philips unfurled Smart Shaver Series 7000 with Bluetooth technology to enhance the end user experience. Other major stakeholders in the market such as Jonson & Jonson Private Limited and ITC Limited are planning to intensify their distributor network and are pumping in funds into the health and hygiene market. To foray into the developing economies leading market players are also mulling on acquisitions and mergers.